A beautiful, striped, medium length faux fur throw. Dense in its construction, modern in design. Economically priced and available in our usual 9 standard sizes or our bespoke service for special sizes. Although fairly new to our range, the silver and brown chinchilla fur throws, together with its sister the gold and brown chinchilla design, have fast become some of our most popular fur throws. It is a luxuriously dense faux fur with silvery-beiges and browny-black stripes. This is a very versatile design, being suited to both modern and traditional decors, and offering an air of oppulence at a very affordable price. The silver brown chinchilla design is striped, so it might be helpful to view the photographs of the cushions to get a better idea of the design. If your throw is intended to be used on white or very light coloured leather furniture, may we suggest that you request ivory coloured backing. 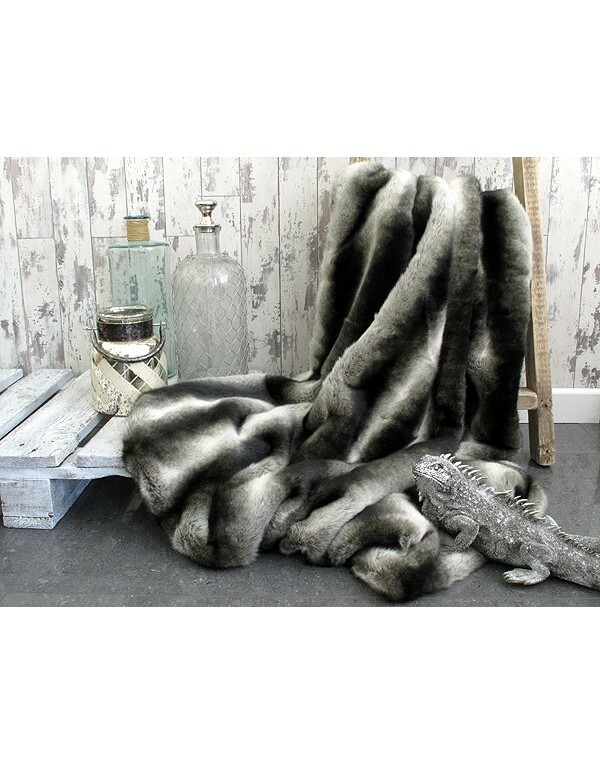 Please note that all throws ordered with main fur on both sides will be classed as bespoke and therefore non-returnable. 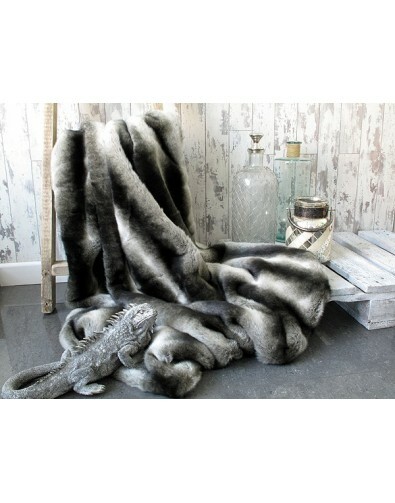 The Silver Brown Chinchilla faux fur is a striped fabric and the stripes run the length of each throw. So for example, a 150cm wide x 250cm long throw will have 250cm long stripes running down the length of the throw. We always give the width of the throw first, and so a 200cm wide x 275cm long throw will have 275cm long stripes. With some size options it may be possible to make your throw with the stripes running across instead of down the length, but you would need to contact us to discuss your requirements before placing the order. However, on a 150 x 100cm thrrw (59" x 39") the stripes run across the width, so are 100cm long. 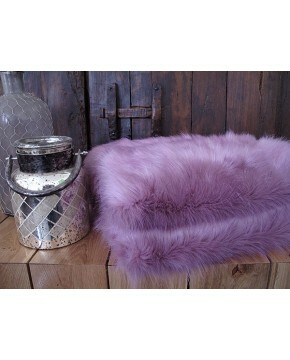 Any faux fur throw in our range that is wider than 150cm (59”) will have joins. When we make the wider throws we would always use a full width centre panel (150cm) and then sew equal strips to each side to make the correct overall size required. For example, a 300cm (118”) wide throw would consist of a 75cm (29.5”) panel, then a 150cm (59”) panel, then another 75cm (29.5”) panel; making a total width of 300cm (118”) approximately. There would be no joins in the length of a throw; whatever the length required. This is the most gorgeous soft, warm and extremely expensive looking throw. Incredible value for money and it has been much admired by everyone who has seen it. The company were excellent to deal with particularly and all communication is prompt and useful. Which faux fur throw should I choose? 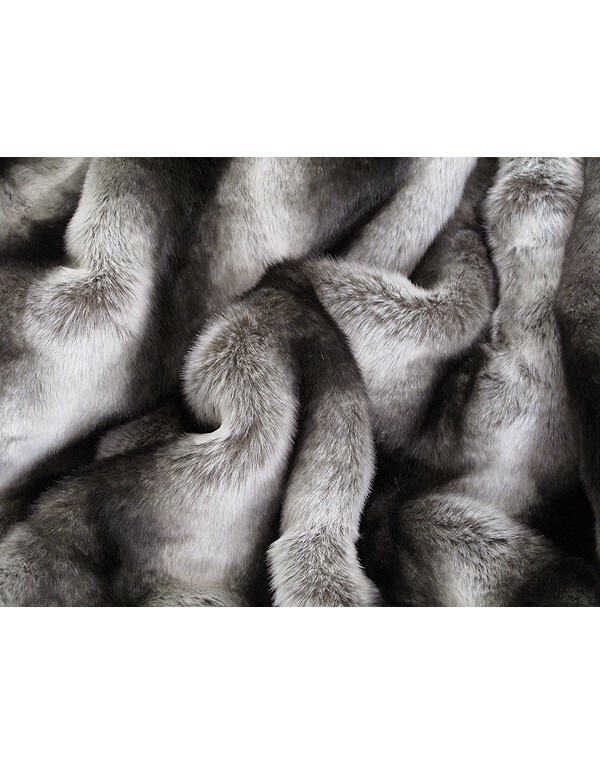 Helping you make a decision on which fur, what backing and what size faux fur throw to buy. Description: A beautiful, striped, medium length faux fur throw. Dense in its construction, modern in design. Economically priced and available in our usual 9 standard sizes or our bespoke service for special sizes.